Police in New Jersey used these tactics to solve a murder case where the victim had traded messages and meet-up plans with her alleged killer on Facebook, days before her disappearance and murder. Investigators discovered the suspect had invited the girl to visit his house after the two discussed BMX bikes on Facebook. The day after the victim disappeared, the suspect liked a page that was devoted to finding the victim. The suspect also posted a message to the victim’s brother saying: “it was an accident the cop waz here & my brother did it.” After the victim’s body was found near the suspect’s home, he was charged with murder. Today it seems that almost everyone has a Facebook page or profile. Not just individuals, but also organizations, corporations, schools and businesses including clothing stores, grocery stores and even drug stores. People use Facebook for many different reasons. Many use Facebook to keep in touch with friends and family. While, some make pages in memorial of lost friends and family members. Stores and other businesses also use Facebook to keep customers up to date on the latest sales and specials. Restaurants, shoe stores, and even drug stores urge customers to “Check In” or “Like” their Facebook page. Every few minutes, people update statuses, check in at different locations, and basically share their every move with the world. They post intimate details about their private lives without a second thought, making it possible for anyone with an Internet connection to look into the window of their lives. Law enforcement agencies can use this very information during the course of criminal investigations. A police officer may access a person’s Facebook page to identify a suspect or their acquaintances. Police may also use social media sites to determine a timeline of events for a suspect. They can see where the person has “checked in” or posted geotagged pictures of themselves at various locations. Police can get all of this information by simply checking Facebook newsfeeds, like a high-tech version of a stakeout. Police can gather intelligence and evidence essentially by spying on suspects online. Although information posted by individuals may be available to the anyone with Internet access, “law enforcement must be mindful of what is legal, as well as what is consistent with community standards and expectations, when using information from a social media site.” Law enforcement personnel should not access this information simply because it is available. This information should be accessed only when there is a valid law related purpose. 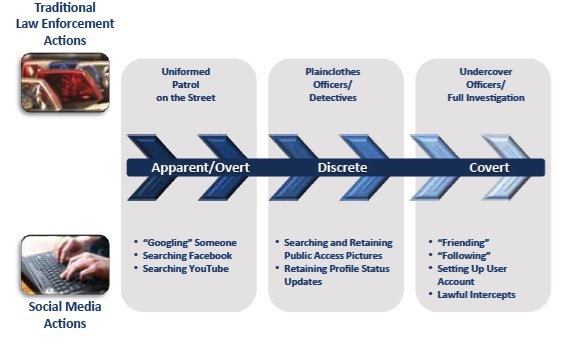 When using social media sites to investigate crimes, law enforcement must follow certain principles. Law enforcement actions must be lawful. Law enforcement agencies should not collect information about the political, or religious associations, or activities of any individual or any group, unless there is a legitimate public safety purpose. Furthermore, information should not be collected unless there is reasonable suspicion to believe that the subject of the information is or may be involved in criminal activity and the information is directly related to the criminal activity. When law enforcement agencies use social media sites to investigate criminal conduct, it is beneficial to have a social media policy. Implementing a social media policy helps to ensure that all law enforcement action is performed with the highest respect for the law and for the community It will also help enhance the community’s trust in law enforcement. The overall purpose of a social media policy is to guide law enforcement personnel on accessing, viewing, collecting, storing, retaining, and using information from social media sites. Social media policies help define and place limitations on actions undertaken by law enforcement personnel and ensure the protection of individuals’ and groups’ privacy, civil rights, and civil liberties. 1. Articulate that the use of social media resources will be consistent with applicable laws, regulations, and other agency policies. 2. Define if and when the use of social media sites or tools is authorized (as well as use of information on these sites pursuant to the agency’s legal authorities and mission requirements). 3. Articulate and define the authorization levels needed to use information from social media sites. 4. Specify that information obtained from social media resources will undergo evaluation to determine confidence levels (source reliability and content validity). 5. Specify the documentation, storage, and retention requirements related to information obtained from social media resources. 6. Identify the reasons and purpose, if any, for off-duty personnel to use social media information in connection with their law enforcement responsibilities, as well as how and when personal equipment may be utilized for an authorized law enforcement purpose. 7. Identify dissemination procedures for criminal intelligence and investigative products that contain information obtained from social media sites, including appropriate limitations on the dissemination of personally identifiable information. A key aspect of a social media policy is articulating the agency’s levels of engagement and authorization requirements to ensure personnel understand how information from social media sites can be used by law enforcement. An effective social media policy should communicate how information from social media sites can be used by law enforcement, as well as the “differing levels of engagement—such as apparent/overt, discrete, or covert—with subjects when law enforcement personnel access social media sites, in addition to specifying the authorization requirements, if any, associated with each level of engagement.” These levels of engagement range from “viewing” information publicly available on social media sites to creating undercover profiles to directly interact with an identified criminalsubject online. The graph below shows a comparison between traditional investigation techniques and social media investigation techniques and includes examples of levels of engagement for social media investigation. The next blog will explore the limitations of using social media sites to investigate criminal activity and examine the information available to law enforcement on social media sites. The terms geolocation/geotagging, defined at http://www.IACPsocialmedia.org/glossary, refer to the incorporation of location data in various media, such as, for instance, a photograph, a video, or an SMS message. This may be used on social media platforms to notify people where a user is at a given time.